Prime Minister Narendra Modi and South Korean President Moon Jae-in may have celebrated the inauguration of what Samsung Electronics' what is claimed to be the "world’s largest mobile phone factory", with Modi characterizing it as “extremely important” for his Make in India initiative to boost manufacturing to 25% India’s economy by 2020 and create millions of jobs. But an in-depth analysis in a news site owned by one of the world's most powerful financial, software, data, and media companies headquartered in Manhattan, New York, Bloomberg LP, believes that this investment was "more the exception than the norm", insisting, "Data from the World Bank and the Reserve Bank of India show manufacturing hasn’t received a significant boost since Modi took office in 2014." Even as recalling that India’s economy may have "overtaken" France to become the world’s sixth largest, something which the Government of India is seeking to propagate as its huge success, the authors of the Bloomberg analysis, Iain Marlow and Vrishti Beniwal, say, the fact is, the country's "manufacturing has shrunk to about 15% of gross domestic product (GDP) from a peak of 18.6 percent in 1995." The article notes that the Make India initiative "is a worthwhile attempt to lure global businesses", but, there is a strong view that "it hasn’t been accompanied by enough meaningful changes to revive manufacturing or alter what is essentially a services-oriented economy." The authors say, "Unlike Beijing’s Made in China 2025 program -- which targets strategic industries from robotics to new-energy vehicles through state investment and subsidies -- Modi’s Make in India plan is more of an investment promotion strategy." 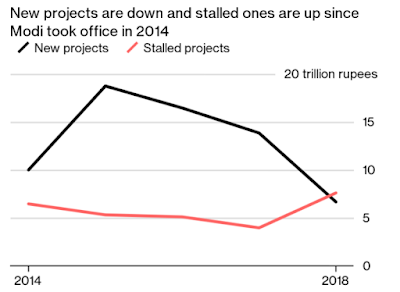 Recalling that "one of the key reforms under the initiative launched in 2014 was the loosening up of foreign investment restrictions in several sectors, including defense", they assert, "However, private data shows investment is falling." 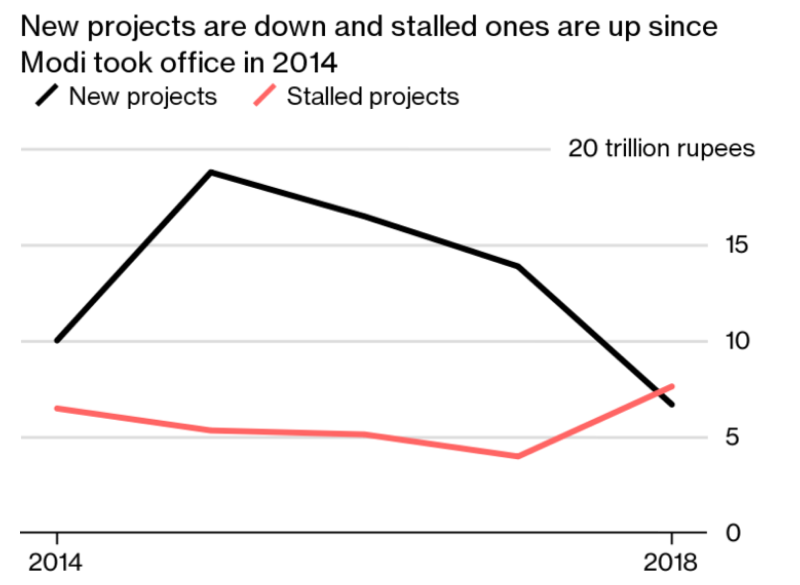 Thus, the Centre for Monitoring Indian Economy (CMIE) has estimated that new project investments have dropped to Rs 6.62 trillion ($96.6 billion) in fiscal 2017-18 "from Rs 18.7 trillion in fiscal 2015." Further pointing out that "the value of stalled projects climbed to Rs 7.63 trillion from 5.29 trillion during that period. 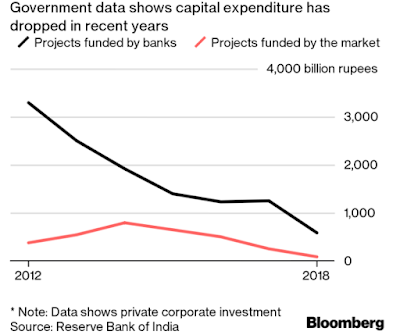 Even data from the Reserve Bank of India’s bulletin show that corporate capital expenditure has fallen since Modi came to power", they quote Mahesh Vyas, CEO, CMIE, as saying that Modi’s Make in India project hasn’t worked, in part because Indian companies invested heavily for years until 2012, well before Modi’s election, and now have excess industrial capacity. According to them, "Those capacities have done little to temper growth in imports of foreign-made goods. Rising purchases of smartphones and TVs have made electronics India’s second-biggest import item after oil, and is pushing the nation’s trade deficit wider." Thus, while under Modi, record foreign direct investment (FDI) may have flowed into India, "improving" the country’s ease of doing business ranking, "Most investment, such as Amazon.com Inc.’s $5 billion commitment to expand operations in India, has gone into the nation’s dominant services and technology industries." 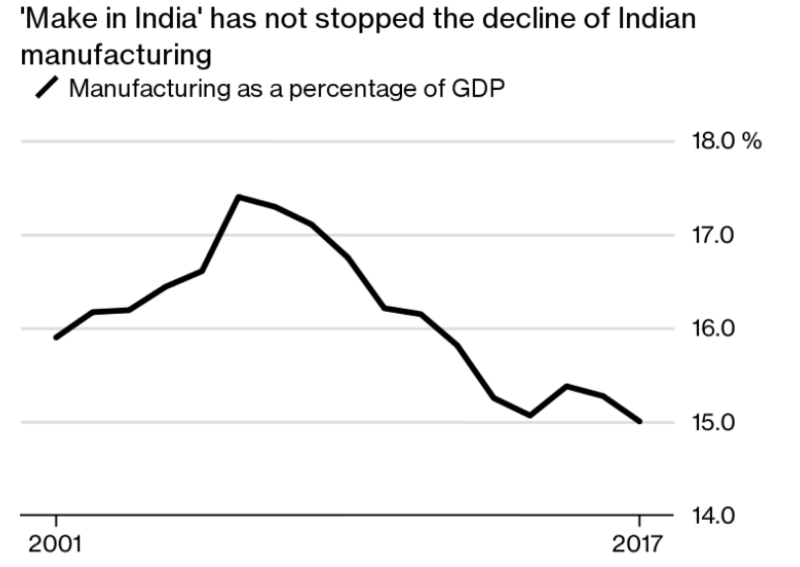 The authors add, "Even the Make in India program’s mascot -- a lion composed of gears -- hasn’t avoided the onerous regulations and occasional political interference that are still common in India and a key obstacle to investment." "FDI (Foreign Direct Investment) remains just 1.2 percent of India’s overall investment." The crucial development is the fall of internal Indian investment, as local investors have the best feel for the possibilities of the internal market. The explanation the article gives (quoting Mahesh Vyas, the Centre for Monitoring Indian Economy’s chief executive officer) is that "Indian companies invested heavily for years until 2012, well before Modi’s election, and now have excess industrial capacity". Adding that it takes time to absorb those (capital) investments." That is true, but mainly for huge projects, Six years is sufficient time for small and medium investments to bear fruit. Instead, according the CMIE's graph, some time in 2017 the value of stalled projects overtook the value of new investments. A more troublesome international environment with worries about expansion of exports, could well be one reason for this. 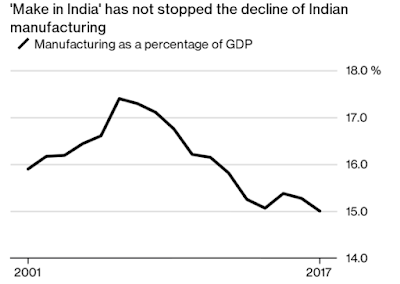 More worrying, given the fact that India has a huge internal market, it also shows a relative lack of trust of local investors in the growth of purchasing power there. This is remarkable as the official growth figures of the economy as a whole are very optimistic. All this suggests that the growth takes place in sectors which are contributing relatively little to a rise in spending power of the public. 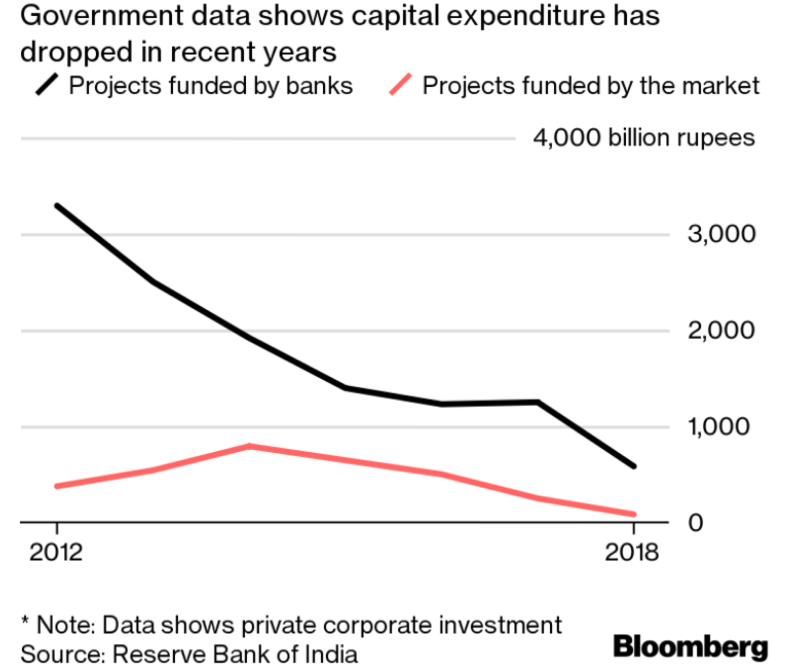 It is hard to see how the Indian economy can sustain its present rate of growth, if investments continue at their present low level, existing projects continue to stall, and the spending power of the public as a whole is not rising fast enough.